There is nothing quite as annoying as sweeping your deck or dusting your bookshelves only to find a fresh layer of dust settling in on them the same day. Dusting and sweeping are chores we cannot avoid, but we can take steps to reduce the amount of dust in our yards and the amount of dust that finds its way into the house. Keeping windows and doors closed is one option, but it is not a very appealing one if you enjoy the cool breeze coming in from the ocean or prefer lower-cost climate control methods, such as opening the windows early and later in the day. While it is impossible to avoid dust altogether, limiting the areas of bare dirt in your yard is one of the most important things you can do to see a significant reduction in dust and also avoid dirt being tracked into your home on the feet of pets, children and guests. As you read on to learn about these 10 ways to keep dust down in your yard, keep in mind that a properly compacted base is a key component in dust suppression — regardless of what method you choose to use on top of the base. Let’s start with a few popular methods that are at least somewhat effective, but not necessarily perfect options for one reason or another. Many homeowners use these methods, and their affordability and simplicity may appeal to you as well, just be sure to consider the cons of using these first five options before moving forward. Sure, keeping dirt wet will go a long ways towards keeping the dust down in your yard; however, this tried-and-true method is not really a viable option during our current state of drought. So we will mention it, since it is one of the oldest tricks in the dust-taming book, but it is not a method we recommend using anytime soon. This is probably one of the most popular methods of keeping down dust for homeowners that want a fast, inexpensive solution. 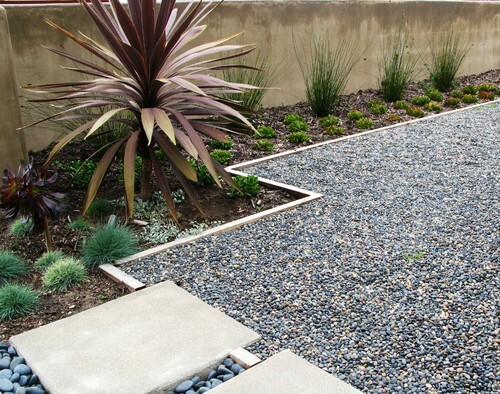 Gravel can be a great ground cover and can be incorporated nicely into your overall landscape design. It can be used to add a new texture and break things up a bit if your yard has a lot of grass or large patios. Gravel makes great walkways and is a no-water ground cover you can use around plants. Gravel comes in all sorts of sizes and colors, which is another reason it is a popular choice when designing landscaping. Pea gravel is generally what folks choose for covering large areas in an attractive way. If you choose to go this route, you might want to check out drainage rock and compare the two. They are very similar, and drainage rock is a bit less expensive, so if you are covering a large area, it may be the way to go. The problem with using pea gravel (or drainage rock) — and the reason it is on this part of the list — is that it can still be quite dusty. Plus, the small pieces can be tracked in by you, your pets or your children, which can be just as annoying as having dirt tracked into your home. It can be even more annoying if you have hardwood or laminate floors that can be scratched by the gravel. So while we are fans of using gravel creatively as part of your overall landscape design, it might not be the right option if you are choosing it primarily to help keep dust down in your yard. You can use hay or straw to help keep the dust down, but it is not the most attractive option and is not necessarily very long lasting. The upside of hay is that it has seeds that may germinate and begin to grow in the area, so if you are interested in taming the dust with a living ground cover, that might be an option. This one is mentioned here mostly because there are homeowners who use this method of dust control; however, there are several reasons that this is not a good idea for most folks. First of all, it will get moldy and rot away if it gets wet. While we might not get much rain, this can also happen from the water you use to irrigate your landscaping, dog water bowls that are tipped over and any other way by which water gets on the ground in your yard. Hay can also be a bit dusty, it can be tracked in on shoes and paws, and it can be quite slippery, which may be an issue for younger and older guests. It can encourage rodents to take up residence in your yard and to use this handy nesting material to make lots of rodent babies to populate your property. Overall, hay and straw are pretty messy options that do not stand the test of time, so cross this one off the list and move on to more effective methods. Calcium chloride and magnesium chloride are not commonly used at private residences and more likely to be found on dirt roads, at construction sites, and on large farms and ranches. These effective solutions can make a significant impact on dust levels but, according to the Environmental Protection Agency (EPA), these options can contaminate groundwater, are toxic to certain species of fish, kill crustaceans, and negatively impact a variety of tree species, including fruit trees. So if you are tempted to bring some of that calcium chloride home from the job site to tame your backyard dust, consider the significant environmental impacts before going with this option. Laying down sod or planting grass seeds is an effective way to cover the dirt in your yard and reduce the dust. Sod is, of course, a quicker solution that reaches its maximum efficacy almost immediately. Grass seeds, however, take time to grow, and natural grass lawns take a lot of time and work to become well established, so this is definitely not a quick fix. There is still soil at the bottom of those grass blades, so you will see a reduction in dust and dirt, but you might not see the significant impact for which you were hoping. Grass still gets muddy after rain or over irrigation, dirt can still be tracked into your home, and the amount of water and maintenance required to keep a natural grass lawn lush and looking its best makes this option simply not worth it for most homeowners. While the above-mentioned options can provide some relief from dirt, dust and mud, each of them has a downside that makes them less appealing. The following five options for suppressing dust in your yard are generally considered more attractive, more effective and more appealing overall. Synthetic turf has an impressive capacity for dust suppression, allows you to have a lush lawn without dirt and mud, and requires very little ongoing maintenance. 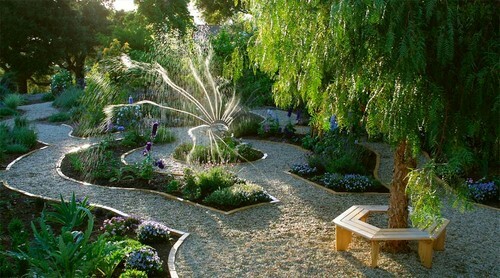 This is a particularly appealing option during times of drought and is an attractive addition to any landscape design. If you are concerned about your children or pets having a place to play but do not like the dust they kick up playing on the dirt, fake grass is an ideal choice that will effectively meet your needs. It can be successfully installed in places where natural grass does not grow well, such as in the shade, and can be used to landscape slopes, swales and other areas where you need a low-maintenance ground cover option that can control erosion and requires no irrigation. 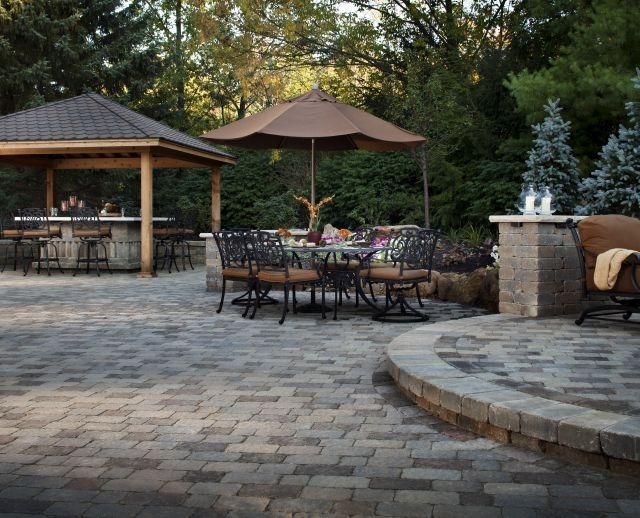 If dust is an issue in your backyard, one easy way to control it is to install patios to reduce the amount of exposed dirt. Paving stone patios are attractive and durable, and they allow you to create inviting outdoor living areas that can even increase the value of your home. They can also be used for walkways to keep the dust down even more and are the perfect choice for a dirt or gravel driveway that needs some serious sprucing up. Paving stone patios, driveways and walkways can be enjoyed the day installation is complete, which means this quick, effective option for keeping the dust down can provide immediate gratification while significantly enhancing your ability to more fully enjoy your home. Concrete is not the most attractive material for patios, driveways and walkways and, over time, it is sure to crack and require repair. It also takes time to cure, which means you will have restricted access to the area and cannot begin using your patio or driveway right away. However, it is an effective option for reducing the amount of dirt around your home and, therefore, reducing the amount of dust. Stamped concrete is a more attractive option but, unfortunately, it also cracks over time and is more expensive. Stamped concrete and paving stones actually come in at about the same price when installing a walkway, driveway or patio. So when comparing these two options, paving stones are the way to go. Wood and composite decks are the perfect complement to a paving stone patio or artificial grass lawn, and a simple deck can even be a do-it-yourself project. 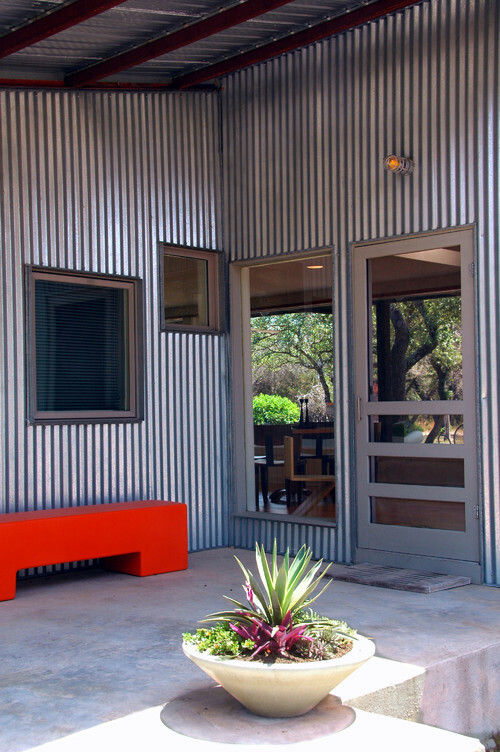 If you go the DIY route, you can save quite a bit of money, which means you will likely be able to build a bigger deck to help cover more of the bare earth in your yard. Building a composite deck is more expensive than constructing one of wood, but the longevity, durability and lower ongoing maintenance requirements may make this option more appealing for some homeowners. 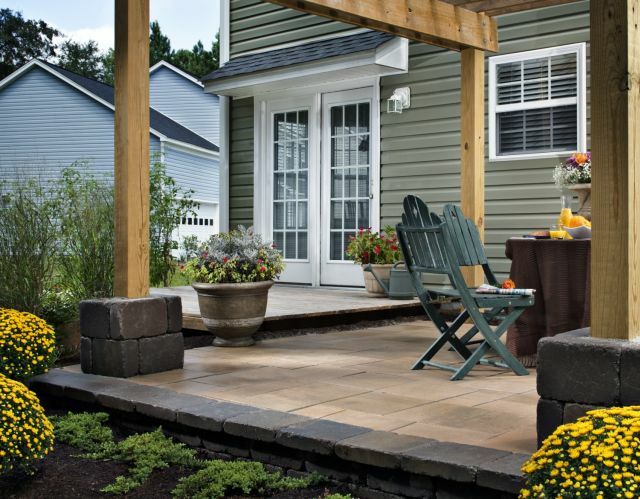 When paired with flower beds, paving stone patios, installing flagstone walkways, lawn areas or other landscaping features, decks can bring in a different texture and the welcoming warmth of wood to enhance your overall backyard design. 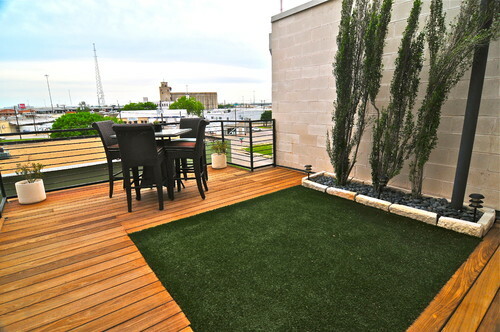 Decks also make inviting outdoor living areas and provide a dirt-free place for children and pets to play. Mulch and wood products make great ground covers that can significantly reduce weeding, enhance your soil’s water retention, and bring texture and color to your yard. Some varieties can be a bit dusty, and any will allow the dust through if you do not lay down a deep enough layer or replenish them every once in a while. However, if you use shredded bark, wood chips or mulch with pieces that large enough to not be tracked in the house, install a thick layer of your chosen material and add more as needed, you may find this inexpensive dust suppression method quite appealing. Keep in mind that the area closest to your home is the most important when it comes to keeping dust out of your indoor and outdoor living areas. 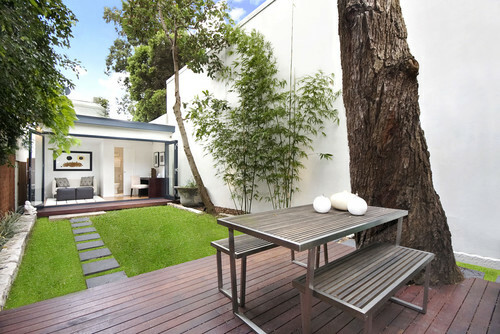 If you have a particularly large property, it may be difficult to avoid bare dirt completely, but you can reduce the amount of dust you have to deal with by landscaping near your home with dust reduction in mind. Having a paving stone patio, artificial grass or wood chips between areas of dirt and your house provides a space where the dirt and dust can naturally come off of paws and little feet before they make it inside. You may also want to consider purchasing doormats that are specifically designed to trap dirt and dust. If you have a larger property, such as an orchard or ranch, you may want to look into an eco-friendly dust suppression option that can be used on a large scale, such as soybean oil soapstock. What are your favorite tricks for keeping dust down in your yard?